We were pleased to welcome guests from Colorado this weekend. Jeff and his wife Donna are business associates and long time good friends. Since the weather was so perfect Jeff and I decided to go on a quick little adventure to the top of Vedder Mountain. We live at about 30 feet above sea level. Vedder Mountain is about a mile away and is about 3,000 feet in elevation. To get to the top we drove about a half hour around the side of the mountain and then up a steep logging road. It's an easy two wheel drive for the first half and then gets dramatically steeper as you approach the top. The last couple of miles is first gear, low range territory and a whole lot of fun. The road ends at the edge of a long drop to the valley below with spectacular views! 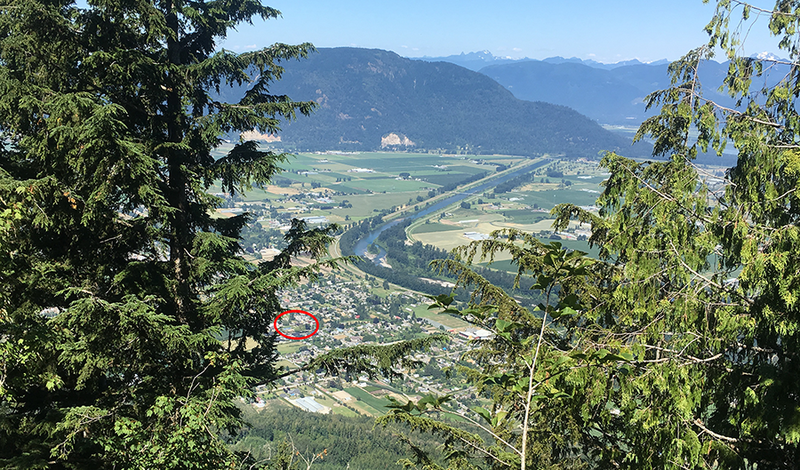 On the photos below I show the view from the top (red circle is our place) and a view from our yard with the red circle showing about where we were. We had a whole lot of fun!